FEATURES * Anemometer probe ( YK-200PAL ) connect with YK-2001TM will become a professional Anemometer * Plastic vane structure, professional. * Low-friction vane wheel assures high accuracy measurement result both in high or low velocities. * Plug and play function, whenever you plug Anemometer probe in YK-2001TM, no calibration procedures are required to be done. * Multi-functions for air flow measurement: m/s, km/h, ft/min, knots, mile/h, ℃, ℉ * Thermistor sensor for Temp. measurement fast response time. * Two temperature units, i.e. ℃ or ℉. * Wide applications: air conditioning, heating systems measure air velocitie wind speed and temperature...etc. FEATURES : * Plug in the Yk-2001PH to be a ATC ( Automatic Temperature Compensation ) probe to gain the Max. possible accuracy. * Temp. range : 0 to 65 ℃, 32 to 149 ℉. FEATURES * Conductivity and TDS probe ( YK-200PCT ) connect with YK-2001PH will become a professional Conductivity & TDS ( Total Dissolved Solids ) Meter. * Innovative feature with built-in automatic temperature compensation values adjustable between 0 to 5.0% per ℃. * Wide automatic temperature compensation range from 0 to 50 ℃. * Carbon rod electrode for long life. * Wide applications: water conditioning, aquariums, beverage, fish hatcheries, food processing, photography, laboratory, paper industry, plating industry, quality control, school & college, water conditioning. FEATURES * Conductivity probe ( YK-200PCD ) connect with YK-2001PH will become a professional Conductivity Meter. * Innovative feature with built-in automatic temperature compensation values adjustable between 0 to 5.0% per ℃. * Selecting "0% per ℃" of Temp. Coefficient Adjust, allows you to take uncompensated conductivity readings. * Wide automatic temperature compensation range from 0 ℃ to 50 ℃. * Carbon rod electrode for long life. * Microprocessor circuit. * Dual LCD display, show both conductivity & temp. values. * Records Maximum and Minimum readings with RECALL facilities. * Data hold function. * Auto shut off prolongs battery life. * RS 232 PC serial interface. * The portable conductivity meter provides fast, accurate readings, with digital readability and the convenience of a remote probe. * Wide applications: water conditioning, aquariums, beverage, fish hatcheries, food processing, photography, laboratory, paper industry, plating industry, quality control, school & college, water conditioning. FEATURES * Non-contact, Infrared Thermometer probe connect with YK-2001TM will become a professional IR Thermometer. * Two temperature units, i.e. ℃ or ℉. 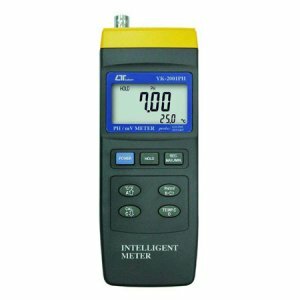 * A factory preset emissivity value 0.95 which satisfies 90% typical applications. * Separate probe, easy operation and remote measurement. * Microprocessor circuit assures high accuracy performance available. * Super large LCD display, easy readout. * Heavy duty & compact housing case. * Records Maximum and Minimum readings with RECALL facilities. * Data hold function. * RS 232 PC serial interface. * Auto shut off prolongs battery life.